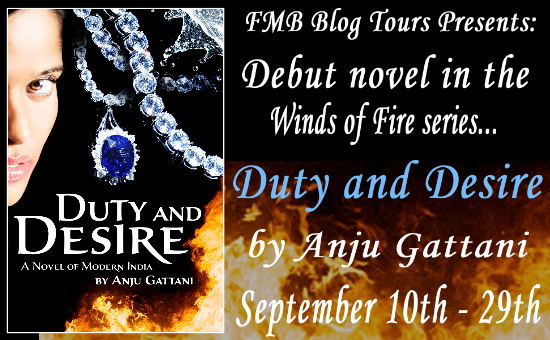 Welcome to the Duty and Desire Blog Tour stop! Check out the excerpt below and a guest post from author Anju Gattani about researching your novel. She has some good info and tips in her post so check it out! Ever wonder what goes into the research of a book? And I didn’t find out until after I wrote one myself. The initial draft of ‘Duty and Desire’ took 1.5 years to pound out… after which I learned, from attending chapter meetings and talking to professionals, that it wasn’t 1 book but 1 story. The story was equivalent to 2 books and many more to follow in my ‘Winds of Fire’ series. I had done the research for my protagonist, Sheetal, an oil painter/artist by profession. I had also done the medical research (a portion of) for the book (there was more to come & I appreciate my blindness and younger Dr.Sister). But I knew something was missing. Something HUGE. What? I looked at my characters, examined my story with a microscope and realized it wall all black and white. Sure, Raigun had color. Lots of color. The grass was green. The sky was blue. The earth was… you get the idea. But the characters were colorless and lifeless. Learning how to flesh out my characters took care of the latter (several years). But how was I supposed to breathe color in them? My super-wealthy and flamboyant characters, Sheetal and Sanjeet, needed someone to dress them up… and who better than real fashion designers? I contacted the editor of New Woman magazine, India, (a wonderful friend who I had the privilege of working with and freelancing for) and explained my fictional plight. She put me in touch with 2 of India’s leading fashion designers Anita Dongre http://www.anitadongre.com and Arjun Khanna http://www.arjunkhanna.com. These industry pros designed the wedding attires and ensembles (throughout the story) for Sheetal (leading female) and Sanjeet (leading male) in ‘Duty and Desire’. Then came lifestyles of the rich and famous. How would someone like Sheetal achieve major weight loss? Anita presented a choice of Tai-Chi or Pilates. Bingo – Pilates! This led me to familiar territory (the gym) but unfamiliar turf – the Pilates studio. Not only did I sit through Pilates sessions and understand the special apparatus used, I began practicing Pilates as well. practicing Pilates, being empowered, learning with each rewrite and research, numerous themes underlying the story… discovering layer after layer to each character (including secondary ones) and watched the story evolve over 9 years, into a book. Now I ask myself, if I’d known how much research goes into a book what difference would it have made? Would I have given up? Probably. Which is why I consider myself blessed. You see, I still miss seeing the elephant in the room. I still don’t have the foresight to avoid stepping in elephant poop. I still notice the speck on the wall instead. *Squelch* Oh dear! Think I’ll have to wash my feet. I didn’t realize my head was already in the third book. 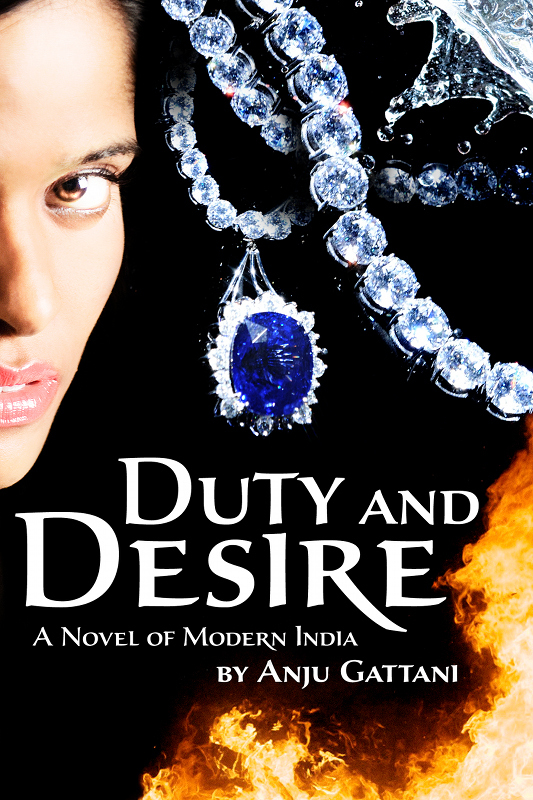 Thanks for hosting me and my debut novel, DUTY AND DESIRE. I hope you enjoy the read and congratulations on your editorial success!